What's in Store for the Week of October 1st? Be prepared for two nights of math homework this week, and a quiz on division of fractions on Thursday. Remember to complete your math journal by Thursday and your TenMarks assignment by Friday. 1. If you are ordering anything from Scholastic Book Clubs, please give your order and payment to me by Tuesday. If you are paying by check, make it out to Charles Ellis Montessori Academy. 2. This Friday is another dress down day. It will cost you one dollar to participate, and all the proceeds will go towards Pink Out for Breast Cancer Awareness. Ms. Diane guided us in a tasty review lesson today about rocks. With her guidance, we created sweet treats that represent each of the rock types we've studied over the past two weeks: igneous, sedimentary, and metamorphic! Check back here soon for the recipes! Wednesday, October 3, 2012 is International Walk or Ride Your Bike to School Day! Join children and adults around the world to celebrate the benefits of walking and bicycling! Ms. Patra will greet you outside with an incentive for joining the fun from 8:00-8:25. Don't forget your helmet if you are riding your bike. 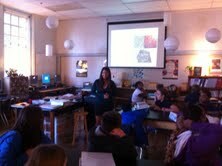 Ms. Diane will be conducting a culminating activity to finish up our studies on the rock cycle this Friday. She is requesting that everyone donates one supply for the lesson. Please see the half-sheet stapled to the front of the progress report for your assigned item. Please let me know if you have any trouble acquiring the item. We are having a great time researching the rock cycle! Here two classmates work together on an experiment concerning chemical weathering. Progress reports will be sent home Monday. Please review, sign, and return it to your homeroom teacher Tuesday, September 25. If you have any questions, simply jot a note on the coversheet and Ms. Carol or myself will get back to you ASAP. As you already know, grades are not stored on the county gradebook software during the 1st term. This allows for a period of transition for the students who are not yet accustomed to receiving a large number of graded assignments. Starting the 2nd term, all grades will be stored in gradebook software and reportcards will be printed. You will have 24-hour secure access to all of your child's grades by logging onto the PowerSchool Parent Access website. To set up your account, please see Ms. Debbie in the office for your secure code. Codes can only be given to parents (not students) and you must show a driver's license or other government ID. Even though grades will not be viewable until the second term, it's best to set up your account now so it is ready to go for the beginning of the next term. Help Charles Ellis support America’s Second Harvest Food Bank!! The FalCan Food Drive School Challenge presented by Publix and UnitedHealthcare is an opportunity for schools to help fight domestic hunger by collecting canned and/or non-perishable food items. The school collecting the highest total pounds collected will receive exciting prizes from the Atlanta Falcons!! What Can You Do To Support Our Cause? Beginning Oct 1 – Oct 29 Drop off canned and/or non-perishable food items in the barrels in the front foyer. Happy first day of Fall! I really do enjoy the hot and humid weather in Savannah, but i'm also looking forward to the cooler weather promised by the coming of autumn. In math this week, we will be reviewing division. I know division is something that you have been doing for a few years now, but I really want to take a deep look at what it means to actually divide numbers. After a review of long division on Monday, we'll take it up a notch and throw some decimals in the dividend and divisors. Be on the lookout for two division homework assignments this week, and a division quiz on Thursday. Your TenMarks assignment will also focus on division of decimals. Please complete TenMarks by Friday. We will also be continuing the MAP math assessment this week. I hope to have everyone who has not taken the assessment complete it this week so we can get back to a normal workperiod. Please study the following items for your test on Friday. You will also need to review your vocabulary list given to you last week. earth’s surface. It is common around volcanoes. It cools quickly on the surface and contains very small or no crystals. surface. The magma cools slowly and forms large, visible crystals. heat and pressure that are involved in the formation of igneous or metamorphic rocks. Formed of weathered rock/mineral fragments, crystallized minerals, or from the remains of once-living plants and animals. pressure, or a combination of both. metamorphic rock due to the pressure from the Earth above it. 1. Your three choices from your Hard Rock Cafe menu are due Friday. 2. A science journal entry will be due Thursday. Please write at least five thoughtful sentences in response to the prompt. 3. As you finish your menu sheet, I will have three choice labs associated with the rock cycle that you are more than welcome to explore. Please remember that only two people at a time can work on each lab, copy the lab procedures and answer questions on a piece of notebook paper to be submitted to me, and return the lab materials to their original condition once the lab is completed. Finally, since Friday is the last Friday of the month, it is a dress down day! But, I want everyone to wear a smile that day, too because it is also Fall picture day! Mr. Charles just gave word that picture day will be rescheduled. BUT, Friday is still a dress down day! Some students decided to research different rocks and share their findings with classmates by creating posters. They identified the rocks by type, composition, and drew sketches of each. Nice job! You rock! We are rolling right along through September! I'm happy to see so many people beginning to feel comfortable in the classroom and following our daily procedures without much intervention from myself. If you are one of my homeroom students, please remember to read the screen each morning for important instructions to follow before lessons begin. After our lesson on Monday, you will get some homework and classwork associated with it. In addition, I will be having some small group lessons to review it throughout the week. You will receive a math-focused journal prompt that I would like you to thoughtfully respond to. I will collect your journal entry on Thursday. I will also be starting MAP testing in the classroom. This online assessment will be used to see what you already know, create learning goals for you to achieve this year in math, and help me plan focused lessons. More information about MAP testing can be found here. 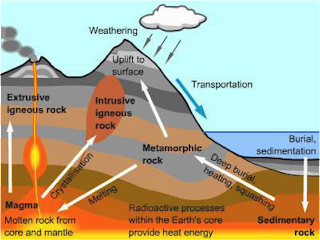 rock cycle- the series of processes in which a rock changes forms, changes from one type to another, is destroyed, and forms again by geological processes. erosion- the process by which wind, water, ice, or gravity transports soil and sediment from one location to another. This choice sheet will be due in two weeks on Friday, September 28th. I'm excited to see how creative you can be with your choices! Remember to use your time wisely over the next two weeks so you are not rushing to complete you work at the last minute. Rushed work is usually not your best, most thoughtful work. Ms. Cathy will stop by Monday to speak to us about some work she is doing for the Savannah Ocean Exchange. A group of students decided to weigh some geometric solids while studying the metric system today. In addition to learning about the gram, we also found out that a scale is a very delicate instrument! Who would have thought we would have so many "budding" landscape architects among us!?! Today we used the geometric pattern found in the just opened Ships of the Sea Museum garden as inspiration to draw our own mathematical arrays. 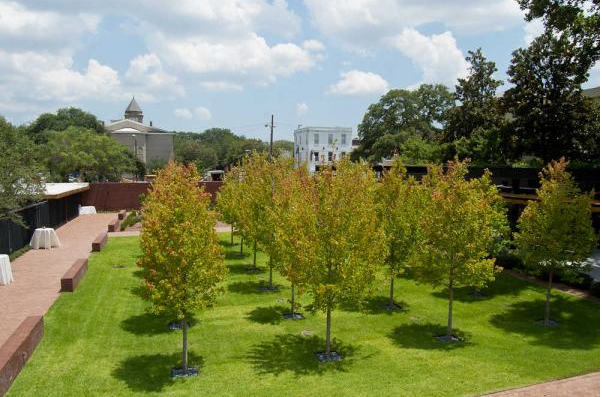 The North Garden at the Ships of the Sea Museum in Savannah. Notice how the trees create an array formation. By creating squares and rectangles using a certain number of "trees" we were able to find the factors of different numbers. We compared these factors to identify greatest common factors between two or more numbers. A student models how 18 trees can be organized into a number of arrays. Say Hello to Ms. Cathy. Ms. Cathy, a marine biology graduate student from Savannah State University, stopped by today to talk to us a bit about minerals found in the ocean. Ms. Cathy will be visiting us each Monday and Thursday morning to tell us about her work, share some interesting research, and help us with our studies. Progress reports will go home today. Please sign and return them to your homeroom teacher tomorrow, September 11. Charles Ellis Montessori Academy is celebrating its 25th year as a public Montessori school. As part of the year-long Silver Jubilee celebration, all alumni and those who worked at Charles Ellis over the past 25 years are invited to attend an Alumni Breakfast to be held on October 26th, 2012 at 7:30 am in the Ellis Media Center. Those who attend are encouraged to bring along any mementos or pictures they may have from their time at Charles Ellis to share. Please RSVP by October 19, 2012 with your name and years you attended Charles Ellis Montessori Academy to Trent Kissinger at trent.kissinger@sccpss.com. More information about the Silver Jubilee can be found at ellissilverjubilee.blogspot.com. Charles Ellis Montessori Academy is the oldest functioning school in Chatham County. It is part of the Savannah/Chatham County Public School System. The landmark 70-year-old, two-story red brick schoolhouse is located at 220 East 49th Street in Savannah, Georgia. The school uses the Montessori method of education, an alternative to traditional classroom teaching styles. The philosophy behind the Montessori method is that the educator is merely a facilitator, and that children, given the correct environment, will seek to challenge themselves academically. Differences between Montessori and traditional public schools include multi-age classes, parent-teacher conferences instead of report cards, hands-on learning and teachers specially trained in the Montessori method, which stresses individual learning. Maria Montessori, the first female doctor in Italy, founded the Montessori method in the early 1900s. If you are interested in joining any middle school sports, please take note of the following memo from Ms. Christy. All students MUST have a current physical on file to participate. Physical forms may be picked up/dropped off in the Media Center during Coach Lesley’s absence. Softball: If you want to try out for the team, your paperwork (including physical) must be completed by Monday. You must be at practice on Monday to be considered for the team. Cross Country: The first meet is Thursday, September 13. You need to get a jersey before the meet. There are 4 meets in total. I hope you had a wonderful weekend and are relaxed, refreshed, and ready for another wonderful week at Ellis. This week in math we will be focusing on finding the greatest common factor (GCF) of two numbers. It is really important that you are not getting it mixed up with LCM that we studied last week. I want you to really focus on using the two interchangeably without getting confused. Get ready for some classwork and homework that will prepare you for a quiz on GCF and LCM this Thursday. If you feel you need additional lessons on either, please don't hesitate to ask one of your classmates or me for a review. Finally, i'm assigning you another TenMarks math assignment that must be completed by Friday. Remember, this can be classwork or homework. 1. Surface mining- the top layer of earth is removed from an area where minerals are found. The minerals are removed and the earth is put back into place. 2. Subsurface mining- Deep passageways are dug into the earth to mine such minerals. If you are planning on ordering a book from our Scholastic Book Club, please have your order to me by Thursday. Also, if your parents are writing a check, make sure it is written to "Charles Ellis Montessori Academy". As a special bonus, keep in mind that every dollar spent will also go towards earning free books for our classroom library! This week, students became detectives to discover the identities of mystery minerals using knowledge of their special properties. 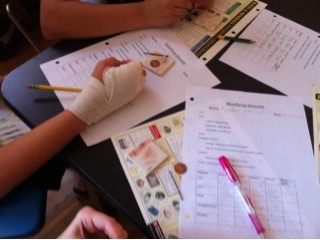 We tested color, hardness, luster, cleavage/fracture and streak. Nice job, super sleuths! During our talk about minerals there was a lot of interest in the Hope diamond. Check out this website from the Smithsonian Institute that has tons of information about this mysterious mineral. Also, you may want to view this blog entry from my trip to Washington DC where I got a chance to see the Hope diamond in person. I hope I don't get cursed, too! The Week of September 4, 2012. Happy Labor Day! I hope you are enjoying the time off and relaxing so you will be ready to go bright and early Tuesday morning! This week in math we will be talking about finding the least common multiple (LCM) of two or more numbers. This is a topic you may have investigated in the past, but I want you to really think critically about what multiples are and how they can be used to help you solve problems you may encounter in your every-day life. We will write our first journal entry concerning LCM. I will give you the prompt on Tuesday, and I will expect a response written in your journal by Thursday. This journaling is expected to be classwork, but you can take it home to do it if you have not completed it by the end of the day Wednesday. In addition to the journaling, you will have some LCM classwork and at least one homework sheet to complete. Finally, you must complete one TenMarks assignment (10 questions) by Friday. While you are working I will be giving small group lessons based on your needs as identified by the GAT you completed the first week of school. You will also have a test on what we studied concerning minerals on Friday, September 14th. It will take careful planning to complete your assignments and properly prepare for your vocabulary quiz and mineral test. It is imperative that you are focusing and working with good purpose. This week you will also meet Ms. Cathy. She is a marine science graduate student who attends school at Savannah State University. She will spend a lot of time in our classroom this year helping you with your studies and sharing with you her exciting dolphin research! She has a wealth of knowledge about oceanography and scientific processes. Please welcome her to our classroom.